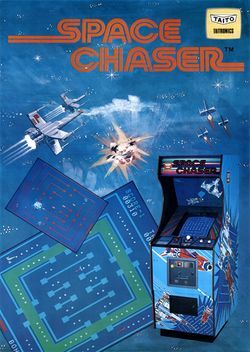 Space Chaser is an arcade game that was released by Taito Corporation in 1979; it utilizes an Intel 8080 microprocessor (running at 2 MHz), with discrete components, a Texas Instruments SN-76477 and a DAC for its audio. The player must use a 4-way joystick to direct a yellow spaceship around a maze (which contains 124 pellets), while trying to avoid the missile(s) which are chasing it - and like Gremlin Industries' Head On and Sega's Car Hunt it came before Namco's signature character. The player also has a single button, with which to accelerate his ship, but doing so will decrease the fuel gauge at the bottom of the screen (and the end-of-round bonus that goes with it); the first round has only one magenta missile (which will chase directly after you), while the second one has a magenta missile and a white one (which will not chase directly after you). The third one introduces the "green zone" that causes the missiles to speed up when you are in it while the fourth one has two magenta missiles - and from the fifth round onwards, the green zone will be a permanent feature of the maze. You shall receive 10 x the current round's number, for every pellet you collect (after the ninth round, they'll stay at 90 points) and receive an extra life at 10000 points (by default); also, if you hold down the 2 Player Start Button when it says "INSERT COIN" upon the title screen, then insert a coin, and press either Start Button to begin the game, you will have two more lives than usual. Given that the maximum amount of lives you can start with for this game is six, this means that you could start out with a maximum of eight lives, and if you manage to reach the bonus value without dying you could have nine; the screenshots below are also inaccurate (due to imperfect colour emulation in MAME). This page was last edited on 4 June 2014, at 09:09.